88 down, 1 more for history. 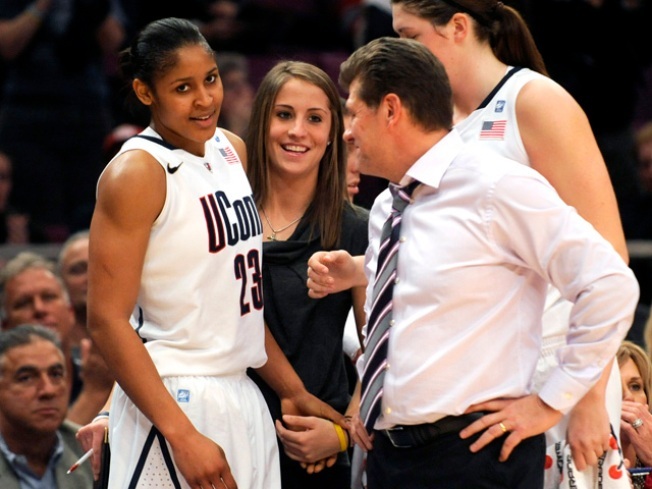 Geno, Maya and the rest of the Huskies go for the consecutive wins record tonight in Hartford. THE FINAL COUNT-UP: This is it. A night, more than two years in the making. Tonight, at the XL Center in Hartford, the UConn Women can officially claim their spot as one of the best teams of all time. If they beat the Florida State Seminoles (and really, who doesn't think this is going to happen? ), they will have achieved something no other program ever has in the college basketball universe. Imaging being unbeatable for 89 straight games? It's truly a remarkable feat, that deserves to be celebrated, admired and awed. Tip-off is at 7 p.m. Tickets to the game are $22. KENTUCKY WATERFALL, HOCKEY HAIR, 10/90, THE MISSOURI COMPROMISE: Is there a better hairstyle than the mullet? We think not. And does the mullet exemplify any style of music more than '80s glam rock? Again, we think not. Tonight at Mohegan Sun, brace yourself to check out the premiere group for the "hair band" fanatic. Playing the best of the '80s, Mullet will play all your favorites from classic bands like Bon Jovi, Def Leppard, Poison, Loverboy and oh, so many more. The band has perfected its sound and performance over the years, and promise to transport you back to a time when Aquanet ruled the world. The free show starts at 8 p.m. DINING DEAL: While you're out spending gobs of money on your holiday shopping, the last thing you want to do is go home and cook dinner. And the second to last thing you want to do is pay too much for a nice meal. So tonight, once you've finished braving the malls and shops and post office, head over to Apricots in Farmington. Their Recession Buster menu is sure to please. Tonight's specials include lasagna with garlic toast, all for $10 a meal (bring a little more for, ya know, drinks and a tip).